Weeks 3 and 4 went pretty well. Week 4 was a short week- Labor Day on Monday then I was gone to attend a funeral on Tuesday. The substitute teacher on Tuesday seemed to do a great job! I was nervous, afraid I would forget something. I did forget to specify what lesson to do with the special ed. class but he chose one of my "substitute" lesson plans and it was fine. 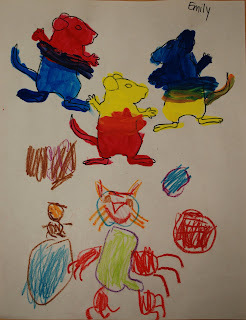 Kindergarten- The students drew cats to go with their Mouse Paint mice. I showed them how to break a picture down into shapes to make them feel more confident. There were about 20 Cat Fancy magazines in the room when I took over so it actually worked out that the students could look at cat pictures while they drew. Some went all out adding toys, food, or a house when I encouraged them to add more details. They finished early so I got them started on their next project. The students finished their new projects in week 4. They wrote their first initial on a sheet of paper and drew around it with many colors and many different kinds of lines. We talked about line as an element of art and drew lines with our fingers in the air. Some of the students just had fun scribbling and others really understood and tried to draw different kinds of lines. First Grade- Students used crayons and markers to add pattern to the quilts. I showed the students a slideshow with traditional quilts, art quilts, and crazy quilts. Now that they are finished, I am starting to mount the blocks on colored construction paper so it will look like a giant quilt when I hang them up in the hallway. Second Grade- I talked to the students about blending colored pencils and drawing with color instead of scribbling or doing a coloring book look. I showed them how to choose colors close together on the coloring wheel to blend and how to choose colors across from each other to make a darker shade. The students love animals so they enjoyed using animals to practice patterns. Special Ed.- The students made shoe fish! I showed them how to trace their shoes and then add details like the tail, fins, gills, and eyes. After the marker drawings were finished, the students cut out their fish and I taped it to a piece of blue butcher paper for them. I told them they could add more details with marker so they started to draw hooks and fishing lines all over the page, it was awesome! Third Grade- I told the students that we were learning about innovation and problem solving. I made two examples for the sunflower scratch art but for some reason when I passed out the materials, it was really, really hard to scratch in the lines. We tried the regular wooden tool, I tried sharpening them, we tried paper clips, it was just really difficult. I just didn't know what to do- all of the students just kept telling me how hard it was. I tried and couldn't make it work for me either. I stopped the students' work and asked them if I should do something else with the other classes and they said they still wanted to do the project. At some point in the day, a student tried to erase a line they scratched in which of course took off the black coating. I thought of it later when I was doing some problem solving and discovered that you can actually draw with the eraser. I had the next classes try it and some got really cool results. I decided to add an extra class period so in week 4 the students drew over the white lines with marker. I showed the students how to use two colors of markers like yellow and orange instead of just yellow on the petals. The students were free to make the flowers any color they wanted. I decided to start a landscape painting unit with the PS kids. I had intended to show them the Young Sloppy Brush video (http://youngsloppybrush.wikispaces.com/) but the audio won't work when I hook my laptop up to the projector at school. We just talked about how to take good care of brushes instead and hopefully someday I will get to show the video. Each grade has a couple different requirements but all need to show depth and space with a foreground, middle ground, and background. I created Artist Trading Cards to show for examples for each. Fourth Grade- The students will make fantasy watercolor landscape paintings. I showed them how to draw dividing lines with marker, paint a watercolor wash that fades from one color to another, and how to sprinkle salt on the wet paint to make a different texture. The talking part took a while but the students got the drawing part done and they'll be ready to paint at the beginning of the next class. Fifth Grade- Students will paint any kind of landscape they want but they will use only primary tempera paint colors to mix the other colors they want. Sixth Grade- I taught the students about complementary colors and they will paint any kind of landscape they want using a complementary color pair of their choice. My biggest challenge so far has been adjusting seating charts as I get to know students better. I will post pictures of more completed projects as soon as I get more photographed!